It’s easy to feel adrift these days. The rising tide of social unrest and political extremism can be overwhelming, but on EFF’s 28th birthday our purpose has never been more clear. With the strength of our numbers, we can fight against the scourge of pervasive surveillance, government and corporate overreach, and laws that stifle creativity and speech. 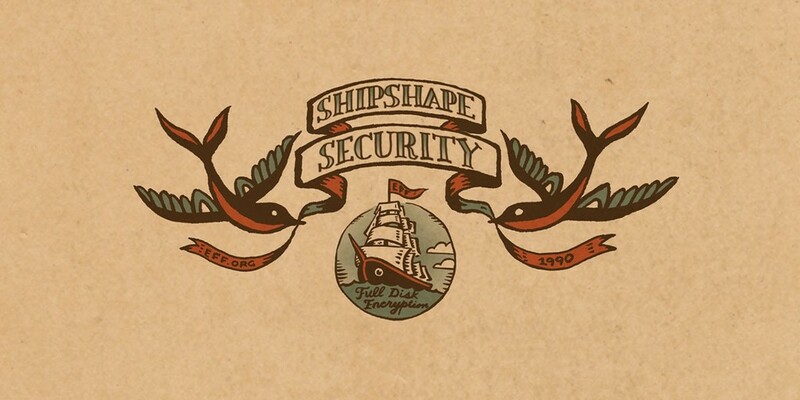 That's why today we're launching the Shipshape Security membership drive with a goal of 1,500 new and renewing members. For two weeks only, you can join EFF for as little $20 and get special member swag that will remind you to keep your digital cabin shipshape. Online Freedom Begins with You! Digital security anchors your ability to express yourself, challenge ideas, and have candid conversations. It’s why EFF members fight for uncompromised online tools and ecosystems: the world can no longer resist tyranny without them. We also know that our impact is amplified when we approach security together and support one another. The future of online privacy and free expression depend on our actions today. If you know people who care about online freedom, the Shipshape Security drive is a great time to encourage them to join EFF. On the occasion of our birthday, EFF has also released a new member t-shirt for this year featuring our fresh-from-the-oven logo. Members support EFF's work educating policymakers and the public with crucial analysis of the law, developing educational resources like Surveillance Self-Defense, developing software tools like Privacy Badger, empowering you with a robust action center, and doing incisive work in the courts to protect the public interest. Before the rise of the Internet, a crew of pioneers established EFF to help the world navigate the great promise and dangerous possibilities of digital communications. Today, precisely 28 years later, EFF is the flagship nonprofit leading a tenacious movement to protect online rights. Support from the public makes it possible, and EFF refuses to back down. Come hell or high water, EFF is fighting for your rights online. Lend your support and join us today.